Northern Ireland and Wales are on the brink of qualification, while Netherlands are struggling. 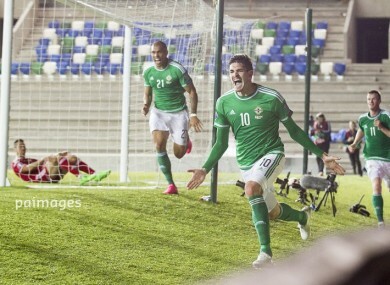 Northern Ireland are on the brink of qualification for the Euros. France qualify automatically as hosts. The top two sides along with the best third-place team (more info on the latter here) qualify automatically. The other eight third-place teams face off in a playoff for the remaining four spots. Iceland and Czech Republic have secured the top two spots, with Turkey and the Netherlands set to battle it out for third. Turkey need just four points to guarantee third, though they seemingly have the more difficult run-in, as they prepare to face the top-two sides. Can still qualify: Wales, Belgium, Israel, Bosnia, Cyprus. Wales need one point to qualify, which they will surely get against Andorra if not Bosnia. Similarly, Belgium just need to beat Andorra to qualify. Israel have a slight chance of finishing top-two if the sides above them slip up, but they will most likely battle it out for third place with Bosnia and Cyprus. Can still qualify: Spain, Slovakia, Ukraine. Spain just need to beat Luxembourg to qualify, while Slovakia will also be on the plane to France provided they beat Belarus. Ukraine will likely have to settle for third unless they win both their remaining games and Slovakia fail to beat both Belarus and Luxembourg. Can still qualify: Germany, Poland, Ireland, Scotland. Germany need just a draw against Ireland to qualify, and even if they lose, they’ll reach France provided they beat Georgia at home. Poland can guarantee qualification by beating Scotland, provided Ireland fail to beat Germany. Otherwise, it will come down to the last game between Poland and Ireland. All the possible permutations for Ireland can be read here. Scotland, meanwhile, need at least four points from their remaining two games to have any hope of third place. Can still qualify: Switzerland, Slovenia, Estonia, Lithuania. England have qualified, while Switzerland need four points to be certain of qualification. Slovenia need to win both their remaining games and hope the Swiss lose at least one of theirs to qualify. Estonia will almost certainly have to settle for third place at best, and even then, will almost certainly have to win both their games to have any chance. Lithuania are still in with a mathematical hope of qualifying, but it’s unlikely even if they win their two remaining matches. Can still qualify: Northern Ireland, Romania, Hungary, Finland. Northern Ireland need just two points from their last two games, while Romania need four to qualify. Hungary need to win both their games and hope that results elsewhere work in their favour, but will probably have to settle for third spot. Finland are still in with a mathematical possibility of qualifying, but would need to win both their games and require Hungary to slip up against the Faroe Islands. Can still qualify: Russia, Sweden, Montenegro. Austria have qualified as group winners, while Russia will join them in France if they secure four points from their final two group games. Sweden need six points, while hoping that the Russians slip up. Montenegro will likely have to settle for third at best, as they are currently one point behind Sweden and three behind Russia. Can still qualify: Italy, Norway, Croatia. Italy need four points at most from their final two games to qualify. Norway, meanwhile, will need to win both their remaining games to be assured of a top-two finish. Croatia sit one point behind Norway and even with a possible point deduction, they could finish second with maximum points from their final two group games. Can still qualify: Portugal, Denmark, Albania. Portugal need just a point to qualify in their final two games. Albania, meanwhile, will be certain to qualify with six points from their final group games, while Denmark will almost certainly have to beat Portugal to have any hope of coming second. Email “Here are all the teams who can still qualify for Euro 2016”. Feedback on “Here are all the teams who can still qualify for Euro 2016”.